The large sensor still cameras that also offer video capability are now plentiful and there’s a resurgence in interest in older lenses from still cameras, film cameras, and even security cameras. My research showed that CS lenses use the same screw thread and size as C-mount lenses, but they were designed to be 5mm closer to the sensor. I wanted to see for myself what exactly that differences meant in terms of usability for the GH2. The GH2 has a special feature- a Extended Telephoto Converter mode (ETC) that uses a smaller part of the center of the sensor but gives a true 1920×1080 image area with no moire or aliasing which is very prevalent in other vDSLR cameras. Moreover, when using a C-mount lens, the image that the lens throws does not cover the whole Micro 4/3 sensor. The ETC mode, however, can be completely covered by the image area of the C-mount lens, depending on the lens. CS-mount, however, are designed to be 5mm closer than C mount lenses. This puts them literally against the rectangular frame that sits in front of the GH2’s sensor, or just a hair further forward. Currently I have found no CS-mount adapters for Micro 4/3 because the mount itself would not be able to hold the lens and still sit as far back as it needs to be able to make the image usable… maybe. It’s really close and someone could be creative and devise a way to do it. But it isn’t going to be me because, while I have ideas, I lack engineering resources to make them into reality. So, for this test I just held the lens in front of the sensor with my hand. It worked surprisingly well, except for some light leakage around the lens and onto the sensor. 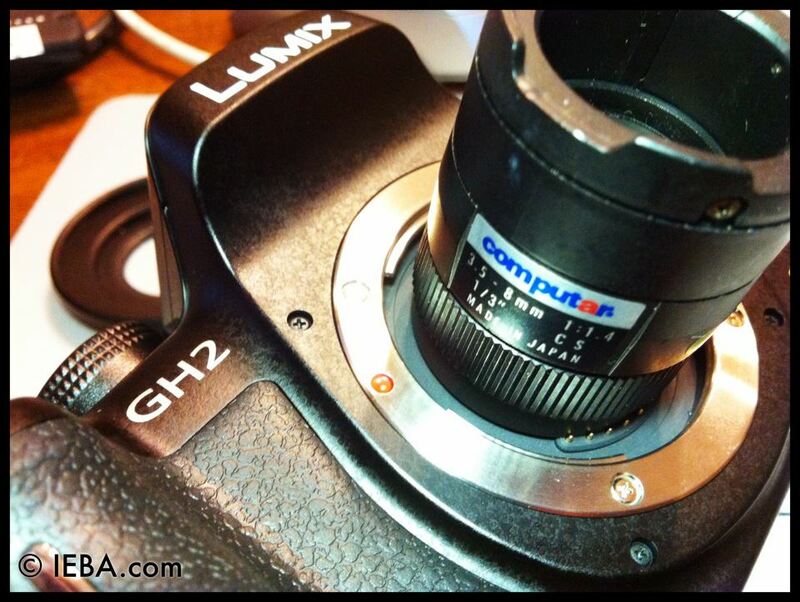 Here’s what this cheap, little CS-mount security camera lens delivered on the GH2. Delivered in full 1080 on YouTube. As a note on the video, when shooting the grass outside, I say it covers the whole frame. I mean it covers the whole ETC sensor area, not the whole, non ETC, 16×9 image area of the Micro 4.3 sensor. The lens covers whole visible frame when zoomed in, but not when zoomed out. However, if you shoot 1080, and then window for 720, you’ll not only get rid of the vignetting, but you can get some image stabilization breathing room around the 720p image area too. I actually liked this little lens. It had good color (when light wasn’t leaking in) and the adjustments were smooth and dampened. There are screws to lock the rings in lace, but aren’t really needed because of the dampening. I’d suspect that cramming this lens inside an adapter for other 35mm lenses, with foam all around it, would work nicely to hold it in place for some stable video. Plus, when zoomed in, it makes an incredible macro lens. If you are interested in trying one of these out for yourself, I purchased a group of them. All the same. Send me an e-mail and it’s yours for $25, shipping included. I only have a few extra so don’t twiddle your thumbs. I am not a store. When the lenses are gone, they’re gone. Is it close enough yet?